When the U.S. Supreme Court ruled that 28 State House and Senate districts were unconstitutionally racially gerrymandered, the North Carolina General Assembly and its actions became illegal. That’s the argument the plaintiffs in North Carolina v. Covington plan to make next week, according to court documents filed Friday. A usurper is someone who takes a position of power illegally or by force. The de facto doctrine is designed to validate the past acts of public officers illegally in office, according to the court document. A court hearing is set Thursday in the U.S. District Court for the Middle District of North Carolina. A three-judge panel will decide a timeline for state lawmakers to redraw the illegal district maps, in addition to deciding whether a special election will be ordered to remedy the constitutional violations. All parties in the case had to file any extra briefs or arguments and witness lists by midnight Friday. Attorney General Josh Stein, who is representing both the state of North Carolina and the State Board of Elections, plans to call witness Kim Westbrook Strach, Executive Director of the Bipartisan State Board of Elections & Ethics Enforcement. Strach’s husband, Phillip Strach, is one of the attorneys representing the legislative defendants, which means he could potentially cross-examine her at the hearing. The legislative defendants did not file a brief or witness list. They did file one exhibit they plan to use in court: the North Carolina Supreme Court’s dismissal in Cooper v. Berger of Gov. Roy Cooper’s request to stop the Bipartisan Board. The lawsuit is over Senate Bill 68, which merges the functions of the State Board of Elections and State Ethics Commission, along with campaign finance and lobbying functions. 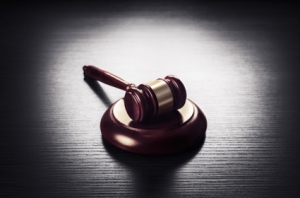 The dismissal of the motion for temporary stay states that the court must preserve the status quo of the Bipartisan Board during its expedited consideration of the case and that the parties are prohibited from taking further action regarding the unimplemented portions of the act. The exhibit document does not state why legislative defendants plan to use the dismissal in their Covington arguments. The plaintiffs in Covington plan to call six witnesses: Milo Pyne, a plaintiff; Rep. Grier Martin (D-Wake); Rep. Robert T. Reives II (D-Chatham, Lee); Gary Bartlett, former Executive Director of the State Board of Elections; George Gilbert, former director of the Guilford County Board of Elections; and Rep. David Lewis (R-Harnett). The plaintiffs also filed a brief to support their request to give the General Assembly two weeks to redraw the unconstitutional maps and to order special elections for March 2018. The brief lays out the argument that the General Assembly became illegitimate when the U.S. Supreme Court made its ruling in Covington. It includes an exhibit declaration from Derb Stancil Carter Jr., Director of the Chapel Hill office of the Southern Environmental Law Center (SELC). In the declaration, Carter says it is the position of SELC that the General Assembly no longer has the authority to override gubernatorial vetoes, and will not have that authority until constitutional districts are drawn and a legal, de jure legislature is elected. He also states (and wrote a letter to the Governor and legislative leaders) that if lawmakers attempt to override the veto of House Bill 576, entitled “Allow Aerosolization of Leachate,” at the scheduled Aug. 3 or Sept. 6 legislative sessions, they could be sued. The other exhibit the plaintiffs submitted to the court is a proposed schedule for the redrawing of maps and a special election to be held March 6. The schedule would require that new maps be enacted by Aug. 11 and the candidate filing period would take place from Sept. 11 through Sept. 25. 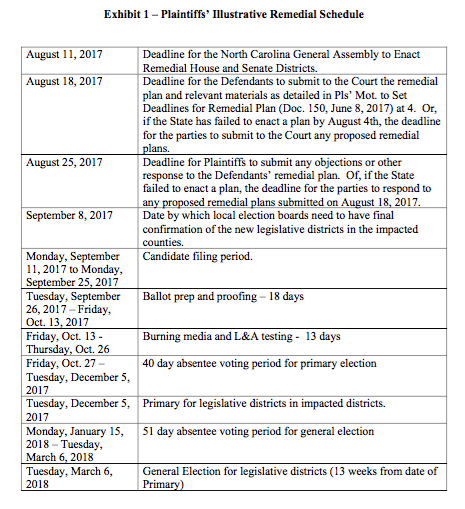 It leaves time for a 40-day absentee voting period for the primary, a primary on Dec. 5 for legislative districts in impacted districts and a 51-day absentee voting period for the general election. The court, the brief states, should order lawmakers to enact remedial districts immediately and conduct special elections before their next session to remove the risk that their acts as usurpers will be challenged as void. Every district should have 4 right angles. Race or Party affiliation should have nothing to do with districts, they should be solely based on population and should never be changed except for population shifts. Actually that criteria should not even be gathered. Anything else embarrasses us in front of the world. We are supposed to be the shining city on the hill and have been turned into a laughing stock.